Indie Authors Spotlight is a weekly meme that will be held on every SATURDAY in the month. It is hosted by Beckie @Bittersweet Enchantment & CYP @A Bookalicious Story. About the Author – Rebecca Weinstein was born and raised in central New Jersey and continues to live there with her husband, daughter, and two pesky rabbits. Rebecca is an alumna of Monmouth University and teaches art at a private high school. She loves to paint as much as writing, and created the cover artwork for all of her novels. A frequent blogger, she blogs on WordPress about writing and her other love: cooking. She is the author of six middle grade and young adult novels, and is currently working on the third installment of the Redstone Series. I have a few works in progress right now. Sometimes I find that I want to work on one project, then another day I’ll want to work on a different one. 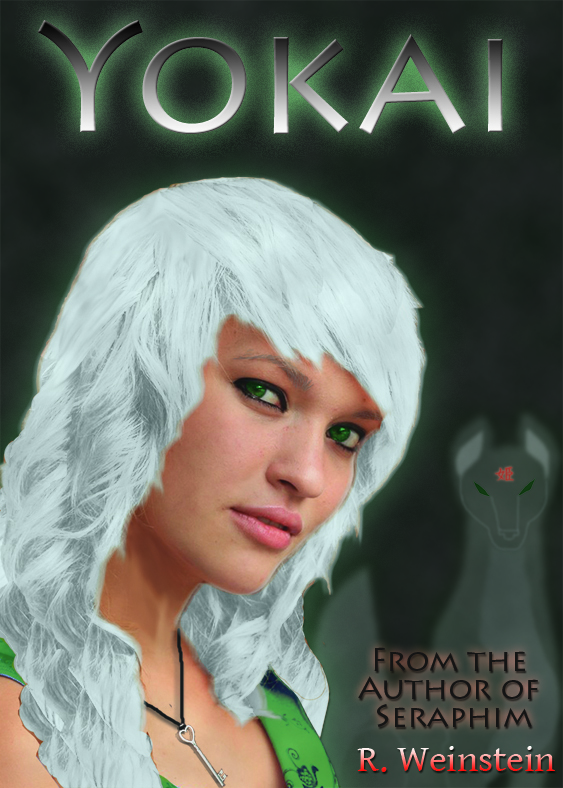 I’m working on the third installment in the Redstone Series, the sequel to Yokai, and a sequel to Amazon. I also have several new works on the back burner. I’m also working on heavily promoting Yokai. I really was so excited to write this novel, that I had many sleepless nights while crafting it. The story wouldn’t leave me alone! I really like the story, and I think that others will really like it too. I was blog hopping during the month of June, including the Paranormal Freebies Blog Hop on June 21-22, and a few others. Whew. I’m a busy lady! Definitely southern Japan, and not just because I’m an Otaku. I love the Japanese culture, and I think their country is beautiful, even though I’ve only seen pictures. I’ll get there, someday. When you were little, what did you want to be when you “grew up”? I always wanted to be a Disney animator. Every time we’d go to Walt Disney World, I’d coerce my family without fail to go through the animation tour in MGM so I could see what the animators were up to. But people change, and although it was always my dream job as a kid, I know it wouldn’t be my dream job today. I can see a little of myself in all of my protagonists. I tend to do that; write a little of myself into them. It makes it a little easier for me to relate to them or to get inside their heads. Even the animal ones. When my father was admitted into hospice nine years ago, he gave me the best bit of advice. He said, “If your dreams of Disney don’t pan out, find a new dream.” It taught me to not dwell on the things that won’t or don’t happen, and to always find a new dream. It’s pretty good advice, and I followed it. Sno-Caps. But definitely with popcorn. It’s the only way. Actually, I recently found out that one of my favorite manga/anime is being made into a live action movie, to be released in Japan in August. It’s called Rurouni Kenshin, and I absolutely love it. If you’ve never heard of it, look it up. It’s about a wandering samurai (a rurouni), a former government assassin, who has given up killing after the revolution sparked the Meiji period. I can’t wait until I can see it, but I know it’ll take a while to get released on a subtitled dvd. You know, a lot of authors don’t respond online to reviews at all. I respond to every review, good or bad. There’s a big difference between responding well and responding poorly. I respond well by thanking them for taking the time to even write a review. They didn’t have to do that. Whether I agree with them or not is besides the point. They are entitled to their opinion, be it good or bad. I don’t argue their points, good or bad, but I make the effort to thank them for their comments on my work. What free time? Haha, just kidding. I like to read, a lot. I also like to cook, and I blog about my cooking on WordPress. That blog is called Android In The Kitchen. I post pictures of the food I cook. One mainstay is the “Daily Bento” post, where I photograph and blog about the bentos I make for my daughter’s school lunch. A bento is a Japanese lunch box, but it’s more than that. Creating bento is an art, but also an act of love. How much love do you put into your own family members’ lunches? HOCKEY! I love the New York Rangers so much, we had hockey elements in our wedding, we have memorabilia around the house, and one of the rabbits actually loves watching it with us! Sixteen-year-old Kit Maguire has never met her mother, made lasting friendships, or had a permanent home, and she’s always known that she was a little different from others. When Kit and her father move to Kyoto, Japan, her father insists that this time will be better, but Kit is reluctant to give it a try. The kids in Kyoto seem to be the same as everywhere else: judging her for her looks before they get to know her. She figures it’s just one more short stop that she won’t make friends, so why bother? With the appearance of her thought-to-be-dead mother, Kit yearns to find out more about her mom, their family, and why she has the ability to conjure green fire. When a girl named Yoriko insists on becoming friends and two of the hottest guys in school vie for her attention, things get complicated. Kit learns just who she is and what she’s capable of, but with that knowledge comes the realization that she may never be able to have a relationship with Riku; as their clans are bitter enemies. Kit hopes that their love will bring the clans together and that she’ll get everything she’s ever wanted: family, friends, and a place to call home. This entry was posted in Saturday Author Spotlight, Weekly memes and tagged author bio, biography, indie author spotlight, rebecca weinstein, redstone series, saturday feature, synopsis, weekly meme, yokai. Bookmark the permalink.